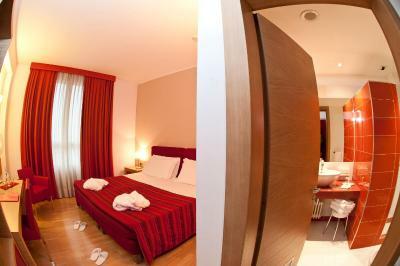 Lock in a great price for Hotel Remilia – rated 8.1 by recent guests! Close to motorway so good for overnight stops. Quiet rooms. Dog friendly - areas where you can walk a dog around and about. Helpful staff. Staff were excellent, very helpful and excellent ambassadors for their Country. 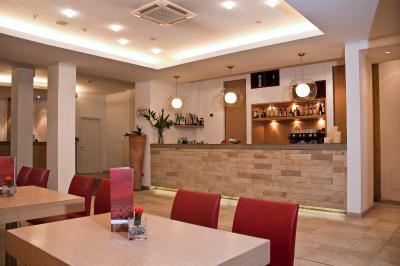 Highly comfy, well maintained , good breakfast and friendly staff. An excellent place to stay! Restaurant was better than most passer by hotels. Breakfast was excellent. Excellent Breakfast. Nice Location, Neat and comfortable. Hotel Remilia This rating is a reflection of how the property compares to the industry standard when it comes to price, facilities and services available. It's based on a self-evaluation by the property. Use this rating to help choose your stay! 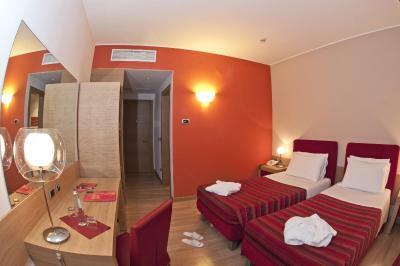 Featuring a furnished garden and a restaurant, Hotel Remilia is 1.9 mi from the historic center of Reggio Emilia. The Reggio Mediopadana Train Station is a 15-minute walk away. 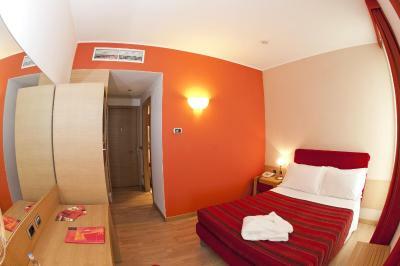 Offering free WiFi and air conditioning, rooms are modern and soundproofed. Each includes a flat-screen TV, a mini-bar and a private bathroom. Some rooms also include a balcony. The Et Voilà restaurant offers local specialties and Italian classics, and the lounge bar is open until late every day. Guests enjoy an extensive continental breakfast every morning. The property is located in a strategic position, 1.2 mi from the Reggio Emilia exit of the A1 motorway and a 3-minute drive from the Fiere di Reggio Emilia exhibition center. When would you like to stay at Hotel Remilia? This soundproofed room features air conditioning, satellite TV, private bathroom, and free toiletries. Includes soft bathrobe and slippers. This larger, soundproofed room features air conditioning, satellite TV, private bathroom, and free toiletries. Includes soft bathrobe and slippers. 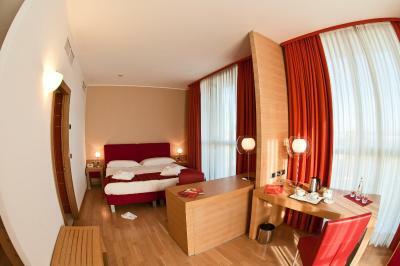 Composed of 2 connecting rooms, one with 1 large double bed or 2 twin beds and the other with 1 double bed. This soundproofed unit features 2 private bathrooms with toiletries and 2 mini-bars. House Rules Hotel Remilia takes special requests – add in the next step! ATM card Hotel Remilia accepts these cards and reserves the right to temporarily hold an amount prior to arrival. Hotel Remilia accepts these cards and reserves the right to temporarily hold an amount prior to arrival. When booking half board, please note that water is included but other drinks are not. Shower door didn’t prevent shower water from leaking copiously onto bathroom floor. Little out of town center. The receptionist didn't speak English. The room is not clean and tidy- walls, equipment and bathroom are dirty and worn-up completely. The hosen simply falls out of the wall. Air conditioner doesn't work. No proper room service (breakfast serving in the room). First time I received only a half of my order. Next day the staff simply forgot to pick up the tag from my door handle. it was available rooms . Unfortunately there were nearly no vegetables available at the breakfast. Besides tomatoes it would be nice to have lettuce, paprika, cucumber or anything similar. Good quality hotel for a good price. Nothing more, nothing less. When we arrived at the hotel, we changed to a room with a bathtub. This was not a problem and was done immediately. With the car you can easily park in front of the hotel. The city center of Reggio Emilia is a 5 min. car ride away, also bus connection is available from nearby the hotel. The rooms are not sound proof. I enjoyed the breakfast & the convenience to the conference I had to attend.